Inspector blogging: Confessions and Cars, or "Lights, Sirens and the Highway Code"
Confessions and Cars, or "Lights, Sirens and the Highway Code"
My Tutor Constable was called Henry. He was wise, humorous and knew the first name of every landlord on our patch. He was also able to fill an entire shift relaying tales of daring do and the particular insight into the human condition they afforded. I remember two of these insights; "No bloke driving a car badly in the history of blokes driving cars badly has ever said 'Sorry Constable, good to know and do you have any useful advice for me? ', and ‘No bloke in the history of blokes being told to calm down, has ever calmed down because a copper told them to calm down'. " And now I would like to share my confession; just between you and me. It's about the driving bit. 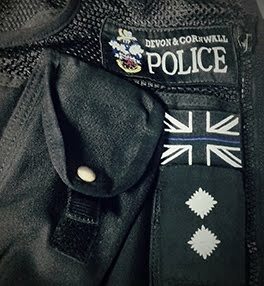 "I am an Inspector in the Devon and Cornwall Police and I have, more than once had a word with myself about my bad driving and twice been set on the path to a Speed Awareness course by the flash of a camera." The words of advice to myself were of the “verbal warning and educating" variety, rather than reporting myself for the consideration of a prosecution. I am not sure I could even report myself. And I won’t waste the time of “Legal” trying to find out. One example was a few weeks ago. I was in my own car heading to a beach with a car full of spaniels. I was driving an old, tatty and suitably scuffed recreational 4x4. I was on a minor single lane road lined by tall hedges and trees right up to the junction about 100 yards ahead. Then I heard it. The “wah, wah, wah” warble of an emergency vehicle. I felt that twinge of anxiety and started to look for the flashing blue lights. About 3 cars back was a police car with its blues and twos in full display. The police speak “I was proceeding….” version is that my vehicle and the vehicles behind me would block the carriageway as it narrowed and the emergency vehicle would have to wait for us all to manoeuvre the junction safely on to the A road. I therefore indicated, to the near side whilst progressively slowing my vehicle and coming to a stop before the road narrowed. The “keeping it real” version is that I said “Where the foxtrot is that coming from?” to the spaniels. I then peered into the mirrors and tried to look over my shoulder. I thought the police driver would be grumpy if I got in the way of the junction. I indicated, pulled left and braked. The car behind me slowed and pulled over too, the car behind that hadn’t seen the police car and went to overtake us. The police car had to brake heavily. The car in the way didn’t know where to go and tried to go to the right, effectively blocking the width of the road. The police car switched all the flashy noisy things off and sat there until we sorted ourselves out. It was not pretty or quick. But like most things all it will tells us is the “what” to do. We have to work out the “how” ourselves. If our "how" is perhaps not the best "how" we may even get told it was bad driving. But hopefully we won’t get told to calm down. I would ask that you drive carefully, are kind and calm and be content with what is already yours or can be legally acquired. PS – I recently saw a version of Henry’s wisdom on the side of a mug. It made me chuckle. Great Article we also provide home inspectors in Tampa you can visit our website http://radiantinspect.com/ for more information. Thank you so much for these driving tips. I really appreciate your effort and I really liked your article. I have recently faced a problem with the brake pad and went to Dublin Brake Pads. They were really good. I am happy for you Jaqulin.